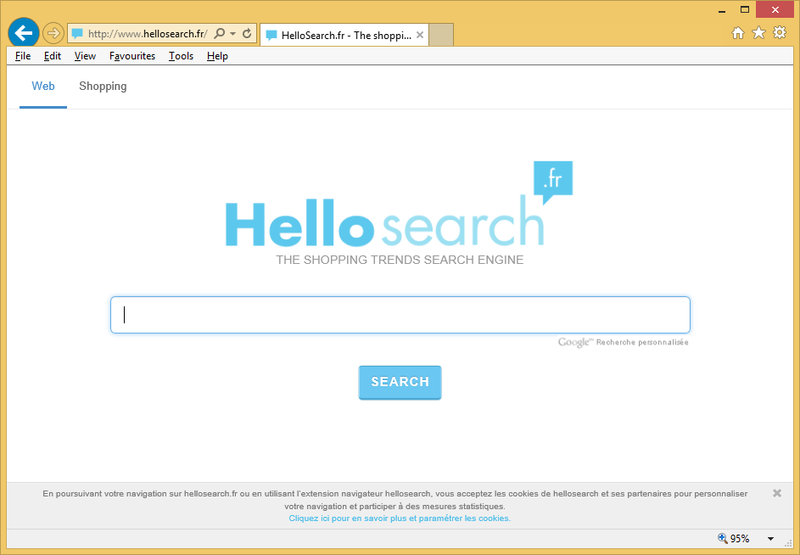 Hellosearch.fr is an Internet search engine. Frankly speaking, it only pretends to be a legitimate search tool because, in reality, it is a browser hijacker which hijacks users’ browsers without permission. We say that it hijacks them because users find new settings applied on their Internet Explorer, Google Chrome, or Mozilla Firefox browsers. It is usually set as a homepage and default search tool, so users inevitably see this search tool when they open their browsers if they get infected with the Hellosearch.fr browser hijacker. If you have noticed this URL at the top of your browsers in the address bar, you must be infected with this threat too. You should implement the Hellosearch.fr removal as soon as possible to clear your browsers. Once you are done with this search engine, you could set a new reputable search provider in its place. The following paragraphs will explain to you in detail why you need to remove Hellosearch.fr from browsers. Where does Hellosearch.fr come from? We believe users when they say that they have not set Hellosearch.fr on their browsers because we know that this search tool is distributed by a browser hijacker infection, and users who find it set on their browsers are surely infected with this computer infection. It does not surprise us at all that the total number of victims is not so low because the Hellosearch.fr browser hijacker is distributed mainly using a deceptive method called bundling. To put it differently, it is spread in bundled packages of software next to freeware and shareware. Users expect to install only a single application on their PCs, but they get a bunch of different programs. There are hundreds of untrustworthy applications spread bundled these days, but it does not mean that it is impossible to protect PCs from them. What we recommend doing is installing security software after the Hellosearch.fr removal. It will make sure that new malware cannot enter the system. How does Hellosearch.fr work on users’ PCs? Hellosearch.fr pretends to be a legitimate search provider, so, after the entrance of the browser hijacker promoting it, it alters browsers’ it finds installed on users’ computers settings. Users find it set as a homepage and default search tool. It does not mean that its presence on your browsers indicates that it is a reputable search provider. Research has clearly shown that this dubious search tool might display sponsored links which might expose users to potential threats. Also, it might record all kinds of information about users and then disclose it to disreputable companies. These are two main reasons it is a must to uninstall Hellosearch.fr from browsers. How do I remove Hellosearch.fr? You need to delete Hellosearch.fr from all your browsers the second you find this untrustworthy search tool. There are two ways to eliminate this search provider. You can either go to erase it manually from your browsers, i.e. change browsers’ settings, or you can erase it with an automatic scanner. In such a case, you will need to open the scanner you are going to use and click one button to start the system scan. It will need a few seconds to delete Hellosearch.fr.